I've written so many articles here on Just Hungry over the almost nine years of its existence, that I've forgotten half of them. But one thing I have not really done so far is delve into the subject of one of the most important ingredients in Japanese cooking, shoyu (醤油）or soy sauce. I have written about soy sauce briefly in years past, but I feel now is the time to go deeper. Note: I am talking here only about Japanese soy sauce. Soy sauce is made by other Asian cultures of course, where processes and ingredients may differ. I'm sticking to what I'm familiar with here as usual. So, let's dive in to the world of Japanese soy sauce. Generally soy sauce is made from a mixture of soy beans, wheat, salt and yeast. Some types of soy sauce also include fermented rice (kome koji) or amazake to give sweetness to the flavor. 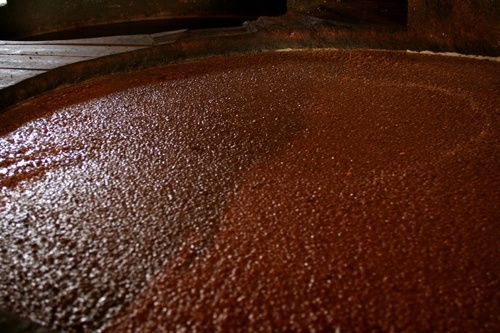 Mass produced soy sauce is made from defatted soy residue (soy from which the oil has been extracted), which makes the soy sauce ferment a lot faster than using the whole bean. Purists argue that this also leads to a loss of flavor and body. The wheat and/or rice is necessary to feed the yeast as the mixture ferments, and to develop a sweet flavor in the soy sauce. Of course this is not how it's done at say, Kikkoman factories around the world. But the process is fundamentally the same. Soy sauce is typically aged at least 6 months before it is bottled, though some are aged longer. While 'standard' soy sauce (see koikuchi below) usually does not have any additives, in some cases things are added (usually alcohol) to prolong the shelf life of soy sauce, or sweeteners to give it a sweeter flavor. By Japanese law, all such additives must be clearly indicated on the label. So if you're looking for a soy sauce that's as natural as possible, look for one with no additives. There are 5 main traditional types of shoyu or soy sauce. The type of soy sauce used in largely influenced by what part of the country you live in, or where the cook of the family grew up. (I know a lot of people outside of Japan tend to think it's all the same and homogenous, but at least when it comes to food that's certainly not the case.) Typical Japanese households stock just 1 or 2 types of soy sauce, unless they are really into cooking. The most widely used type by far is koikuchi (濃い口）soy sauce. Koikuchi literally means 'dark mouth'. This is the quintessential soy sauce that you see for sale from brands like Kikkoman and Yamasa in Japanese grocery stores around the world, and since it is the 'starndard' soy sauce for many people it is not always labeled as koikuchi. Koikuchi soy sauce sales account for more than 80% of the market in Japan according to the Soy Sauce Information Center (SOYIC - Japanese only website). It's the soy sauce of choice in the Tokyo/Kanto area and the north. Koikuchi soy sauce is usually made with equal parts of soy and wheat, plus salt and yeast. This is the soy sauce I use in all of my recipes here on Just Hungry as well as on JustBento unless specified otherwise. Why? Well for one thing I'm from Tokyo, and my mom and her mom and my father's mom were all from the Kanto region. So we are koikuchi folks. Also, koikuchi soy sauce is the 'standard' as noted above, and much easier to get a hold of than other types. The second most popular type of soy sauce is usukuchi　（淡口; kanji scholars may notice that the kanji 淡い is used rather than 薄い). This is a lighter colored, used primarily in western Japan, namely the Kansai region (Kyoto/Osaka), and has about 15% of the soy sauce market share. In traditional Kyo-ryori (Kyoto cuisine), which has its origins in refined imperial court cooking, dark colored koikuchi soy sauce is considered declassé and ruins the flavor and appearance of food. However, don't think that because it's lighter in color that it's less salty. On the contrary, usukuchi soy sauce is saltier than koikuchi soy sauce - 18-19% of its volume is salt, compared to around 16% for koikuchi. In recipes that call for usukuchi soy sauce this is taken into account. Usukuchi soy sauce is also made with soy and wheat, and is often rounded out with the addition of fermented rice (kome koji), wheat gluten or amazake. Soy sauce is graded both by the Japaneese Ministry of Agriculture, Fishing and Forestry (JAS) and an industry group called the Japanese Soy Sauce Association. The official government grades are Special Grade (特級, tokkyuu), First Grade (１級, ikkyuu) and Standard Grade (標準, hyoujun). Grading is based on measuring the chemical composition soy sauce, mainly for its amino acid and alcohol content. The Japanese Soy Sauce Association adds two more grades that are higher than Special Grade: Extra Select (特選, tokusen) and Ultra-Extra Select (超特選, choutokusen). Soy sauce is also graded by experts based on color, aroma, roundedness and other such more subjective criteria. As with most Japanese things, you tend to get what you pay for when it comes to soy sauce. Other things to look for on a label might be "yuuki" which means grown without chemical fertilizers or pesticides (almost organic), and "marudaizu" which means the soy sauce is made from the whole soy bean rather than defatted dregs. Generally speaking, people tend to use expensive, special soy sauces and very assertively flavored ones straight up, for dipping and other uses where it is not diluted by other ingredients. What is nama-shoyu or ki-joyu? Nama-shoyu (生醤油) - unpasteurized soy sauce - seems to be the new trendy thing these days in the U.S. It's exactly what it says - soy sauce that has not been heated to kill off any good or bad organisms. Natural-food fans like it because it's, well, unpasteurized. Does nama-shoyu always taste better? I'm really not sure. I personally think that the soy sauce made by skilled, experienced artisans is the best, regardless of whether it is 'raw' or not. Is nama-shoyu a health food? In my opinion, anything with the high levels of sodium soy sauce has can never really be a "health food". It's a condiment and flavoring, something to be used in small amounts. In that sense, and this is just my humble opinion of course, nama-shoyu is not worth the expense over a good old pasteurized soy sauce. Pasteurization is not 'bad' for you you know - it's one of the greatest innovations in human history. Before pasteurization, people died regularly from food poisoning and such. Many people in Japan called nama-shoyu ki-joyu; both terms have the same kanji characters (生醬油). I've read that they are both the same, and also that ki-joyu is just a culinary term used by chefs and such to say 'straight soy sauce' without the addition of mirin, sake or other ingredients. In English speaking areas at least nama-shoyu is the term used. So now my head is spinning. What soy sauce do you recommend? If you can only afford one soy sauce type (budget or space-wise) in your kitchen, get the best koikuchi (or regular) soy sauce you can afford. It's really the best all-rounder. I usually buy Yamasa Marudaizu or regular Yamasa. I just prefer Yamasa over Kikkoman, but that's just a personal preference. (And by the way, I do stick to Japanese brands; I just find they taste better to me. I tried an 'organic' soy sauce made in the UK once and it was just..lacking.) I do have a couple of extra-special, artisanal soy sauces around purchased in Japan, but they are not really necessary and I actually rarely use them, except for dipping. If you dislike the dark color soy sauce gives to dishes, or have gotten into Kyoto style cooking, you'll want to use usukuchi soy sauce, but it does tend to be more expensive than koikuchi. Your local Japanese grocery store will stock both koikuchi and usukuchi soy sauces, as well as tamari and maybe other types. Your local general-Asian grocery store will probably only have koikuchi (plus soy sauces from other nations). Nowadays you have a wide selection of soy sauces to choose from in the U.S. as long as you're willing to mailorder - go nuts if you want! In France/Europe, be sure to look up Workshop Issé if you want to go high-end with your soy sauce. I hope I've covered all of your soy sauce questions! If not, let me know in the comments as always. Submitted by maki on 2012-08-24 01:54. It's very interesting to read in such depth about the basic staples of Japanese cuisine, but it also reminds me how scarce my local Asian shopping scene is. We have a single "Asian Supermarket", and the owner says he refuses to import Japanese products because they're too expensive. I own a asia shop myself and i can understand your local store owner.. I have to sell 500ml of Kikkoman for about 5-8€ (depending on what soysauce it actually is). since the china ones are so much cheaper i probably sell about 10x more of them compared to the japanese ones.. Note: i used soysauce in my example. but this works for any japanese product, really. It sounds like a Kyushu speciality called kanro-shoyu 甘露醤油, or sweet soy sauce. It's a sweet variation on something called sashimi soy sauce - a rich soy sauce with an almost syrupy texture (similar to tamari but thicker). It is very much a regional speciality, and isn't even for sale nationwide in Japan. I rather doubt you can find it at Japanese grocery stores in other countries...they've just recently started carrying light soy sauce (what people in the Kansai (Osaka-Kyoto) region repfer) in addition to the 'regular' dark soy sauce. So I'm afraid you may have to take a trip back to Kyushu, or else find a Kyushu product fair (held in department stores or in train station plazas and such) or look online on Rakuten. Since I live in a place with a huge Japanese Brazilian community, find soy sauce made in Brazil is not hard, usually from companies founded by immigrants. I try to avoid to buy imported goods for economics and enviromental reasons, although I bought Yamasa once or twice. But since my dad are from Tokyo too, I used to use a lot of shoyu. Interesting thing about the say sauce in Brazil. 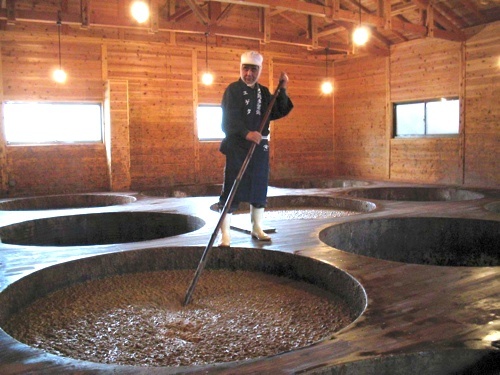 Most of the companies here make shoyu just with soy and koji, no wheat. It means it's very easy to find gluten free products. And since you mentioned gluten intolerance, do you know anything about labelling in Japan. When I lived there, I don't remember reading something related to gluten. Just some information about wheat among ingredients, which doesn't mean nothing since barley and rye have gluten too and even if a product doesn't have any of these grains, it can contain gluten as additives. I have a girlfriend with celiac disease and since I wanna introduce here so much about Japanese, Chinese and Korean cuisine, but sometimes I can't help and I have to buy a imported item because there's no a national equivalent and it's very hard to determine if a product have or not gluten in the formula. Of course, Brazilian laws doesn't allow the selling of any imported food without a translated label, including information about gluten, but I don't trust the translations so I'm trying to understand the Japanese, Chinese, Taiwanese and Korean law about the topic (and ask some friends who I trust to translate labells from Korean and Mandarin). In Japan, all ingredients must be listed on the label. So if something contains barley or wheat or wheat gluten etc it will say so. It may not explicitly say 'gluten free' because that's not a marketing hook in Japan the way it is in say, the U.S.
COULD YOU RECOMMEND A GOOD SOY SAUCE THAT I CAN BUY IN BRAZIL? I HAVE BEEN USING SAKURA PREMIUM BUT ITS CHEMICAL SMELL MAKES ME WONDER EVERY TIME WHY I AM ABOUT TO SPOIL ANOTHER LOVINGLY PREPARED DISH WITH IT...THANKS! This article really cleared up a lot of confusion for me! Thank you so much. And I definitely prefer Yamasa to Kikkoman. I'm not sure why my local Korean-Japanese mart has stopped carrying it. :-( I hope you do an article on noodle dipping sauces some time...that's definitely my next concern. I already have an article and recipe for a noodle soup base: kaeshi. Combine that in various ratios with dashi stock and you're covered for just about any Japanese noodle dish that requires a soup or dipping sauce (except ramen and such that have Chinese origins). I would like to know your thoughts on storage of soy sauce. How long should I keep it? Refrigerate it or no? Japanese markets I find have such good deals on the large bottles, but I don't use that much of it really. I need to do more soy-simmered dishes I guess. Soy sauce doesn't need refrigeration unless your kitchen gets really hot and humid or something, but the more delicate types in particular do keep their flavor and color longer if you keep them in the fridge, e.g. nama-shoyu. If your soy sauce is mixed with something else like dashi, then you should refrigerate it after opening (e.g. mentsuyu). Nice article. ^.^ Now I know a lot more about soy sauce~. I believe usukuchi is marketed in the US as "light soy sauce" and saishikomi as "dark soy sauce." I love both of them in cooking~. Light soy sauce is great for a bright yellow tamagoyaki, and dark soy sauce produces delicious dark clumps of fried rice. All the 'dark' soy sauce in the US is koikuchi soy sauce. Saishikomi commands a premiums price, so would be marketed as such. Is the denomination protected maybe - like a double brewed shoyu from another area in or out of Japan may not use it? I've not seen saishikomi here so far. In health food stores though, there's a brand of shoyu that's "made through a special double brewing process that reduces saltiness and gives the shoyu a more complex and rounder taste". It goes for around 15$/bottle for maybe 350ml and I've never tried it, but it sounds like your description of saishikomi. It's made in japan, but bottled by a Canadian brand. They market it as a "nama shoyu". Unpasteurized shoyu seems to be the "new tamari" in health food stores here. We don't have a great choice of shoyu. The japanese grocery carries like two of the higher grade "wrapped" brands, and otherwise it's Kikkoman US for the small formats, and Kikkoman Japan for the larger ones (incl. the only usukuchi available, in an inconvenient 1 litre format that's expensive and really hard to even get to use half of it before the taste has degraded). There's also Koyo, a local brand, but the sauce is japanese. We have one local brand (Amano) which is actually pretty good. It's produced on a small scale by a Japanese family business (now in the third generation) in British Columbia. It's harder to find in regular groceries and those that have it often run out of stock, but I usually keep a bottle of their shoyu and tamari at home. Their miso is more outstanding. than their shoyu, though. I wouldn't know how it compares to the average japanese artisanal products in the same category, but it's certainly much better/tastier than the industrial stuff. Very nice article.Very interesting to read. Thanks for sharing. When I'm in the local Oriental food section of our grocery store I hope I can remember "yuuki" on a food label from Japan means grown without pesticides. Thank you for sharing that useful information. I use Tamari almost exclusively except for marinating chicken or meat when I use a less expensive soy sauce. Thank you for another great article! I am allergic to wheat and gluten, so I have to go with the wheat-free tamari. I've never seen the Kikkoman gluten-free soy sauce in the US, so it might be an overseas only thing. My question to you and your readers is - do any of you have recommendations for good wheat-free tamari? I've only bought San-J brand so far, but it doesn't take the place of the more luxurious soy sauces I used to buy pre-allergy diagnosis. Here's Kikkoman Gluten-free on Amazon.com so it does seem to be available in the US (by overseas I meant outside of Japan, actually, where I have never seen it for sale). Try coconut aminos vs soy sauce. I add a lemon to coconut aminos then dip my sashimi or sushi in it. I recommend tasting it then add lemon based on preference. To me it tastes bette than the gluten free soy sauce or tamari. I use it all my recipes as soy sauce substitute. i.e. beef jerky, stir fry, marinate, etc..
Coconut aminos can be found in Whole Foods, Sprouts and many health food stores. I find being gluten free sometimes you have to be creative and think outside the box. I found your article because I was at Tokyo Tsukiji Fish Market today eating sushi when I noticed they were putting a brown sauce on top of the sushi. Some of the restaurants do that here in Tokyo while others do not. I was trying a new place today. I didn't have any however I wanted to know what it was. After reading your article I have idea of what it was and very glad I didn't eat is. Since I'm gluten intolerant. I don't live in Japan however I travel a lot in Asia and around the world. Thanks again for the wonderful write up as it was very educating to me. I have bought Lee Kum Kee soy sauce in Hawai'i and brought it home with me. I also use Kikkoman, Kikkoman tamari, and Yamasa. Thank you for the excellent description of soy sauces and the special uses of some of them. Wishing you well in your recovery. Your voice is appreciated around the world. Maybe some of your Australian readers would find this useful - Kikkoman gluten-free soy sauce is definitely available in Melbourne. It's fairly hard to find in regular supermarkets, however I have seen it at Great Eastern Food Centre on Russell Street, and also at Fuji Mart adjoining the Prahran Market. Thank you for the excellent information. I'd like to add that I've noticed a huge difference between soy sauces brewed in the US and those brewed in Japan, even under the same label. US Kikkoman for instance, is burnt, flat, and in my opinion, nasty. Kikkoman brewed in Japan is sweet, bright, almost fruity. How do we find Japanese-brewed soy sauce in the USA? Japanese (not general-Asian) grocery stores have a variety of soy sauces, and you can just look for the country of manufacture. Yamasa I believe does not make their soy sauce overseas. Another indicator is if the original label, not the sticker they put over it, is all in Japanese. I have noticed this too! I lived in Japan for 3 years and it changed my cooking and how I use soy sauce. Since moving back to the US, I cannot stand US made - especially Kikkoman - soy sauce. I always buy my soy sauce from my asian grocery, making sure I have the imported, made in Japan Kikkoman. You would think that Kikkoman would have a standard recipe that they adhere to. Or perhaps it is the difference between the western ingredients? Have you ever written about nameko oroshi? Wishing you and The Guy a great 2012! What are your thoughts on this shoyu? My husband's and my food philosophy is that we can't put a price on health. We use it sparingly and never heat it, so it is worth the price for us. We definitely want something organic and naturally fermented. It says the country of origin is Japan... I hope there are no labeling tricks here. I have not tried it myself, but have heard good things about it. I've been reading your posts in the past year or so and thought it's about time to share a comment. Personnaly, I like the soy sauce from "Lima" (see http://en.limafood.com). It's distributed both in supermarkets and in organic food shops. However, I haven't a clue how authentic this product is. Have you ever tried it? Seems very authentic to me, but like Maki, I haven't tried it. I may try and get hold of some as you've awakened my curiosity. I'm very aware of the Ohsawa Shoyu but it is not readily available in the UK which is the only reason I've never bought it. It has as niche market in Japan but is reasonably popular in North America because of the macrobiotic movement - which isn't a philosophy I subscribe to. Seems like an excellent product to me and the Ohsawa miso (made by a related process) has been highly recommended to me by someone I completely trust. I shopped at a Lima store in my neighborhood of Ohyama-cho while living in Japan. It was a terrific shop. They had organic veg., many gluten free products and other products for people with allergies. Everything I tried - pasta, rice, tea, osenbei - was of high quality. It was very expensive, but very high quality. Apparently Lima stands for "Life Is Macrobiotic." Thanks! I didn't know all that :) and I always wandered which soy to use when trying (not always succeeding) to cook Japanese food! Just curious about how the earthquake in Japan last year affected soy sauce and the export of it? I noticed at my local asian restaurant, they stopped serving Japanese soy in exchange for a Chinese version. Any thoughts? I think your local Asian restaurant is either overreacting, perhaps a few of their customers are overreacting, or they are using this as an excuse to switch to a cheaper brand of soy sauce. Currently, except for food grown in the immediate area near the Fukushima reactors (the 'no-go zone'), food in Japan has been shown to be safe. (There is even debate about the food grown near the reactors, as to what constitutes a 'safe' level, for whom, and so on, but food grown in the area is not making it out of the area; it may be being consumed locally, but that's another matter.) Food exported from Japan has been subject to repeated testing by the countries importing them. I have heard of no reports at all of industrially produced soy sauce being contaminated. It is possible that small, local producers in or near Fukushima experienced some contamination (though I have not heard of any such incidents) - but these are artisanal, expensive, special soy sauces and I highly doubt the restaurant was using any of those. Besides, given the numerous, proven incidents of Chinese food exports being contaminated in one way or another, in some cases on purpose by the producers, it's the height of irony to consider Chinese soy sauce to be in any way 'safer'. That's just my opinion. I found this very useful. And that is an interesting tidbit about the gluten in the fermenting process. My celiac girlfriend loves Asian food, and we've been using gluten free tamari in most of our cooking. But it's nice to know she won't get too sick if we eat someone else's cooking. This article was so timely for me! I was just in our local Japanese import store (Austin, TX is very lucky to have Asahi Imports!) and was a bit overwhelmed by all the different types of soy sauce -- I was unfamiliar with the terminology you described above. Thank you! I'm looking forward to returning to the store much more informed! What difference does the age of the soy sauce make (3, 5 or 10 year old)? I don't like soy sauce D: It's difficult trying to find a replacement for it, cuz replacements are really just variants OF soy sauce. @x@ woe is me. very difficult for me to season rice and veggies. Thank you so much for the helpful information. Could you do the same for miso? There are so many different types of miso and I'm never sure how to use them. Is there a difference bewteen sweet soya sauce by kikkkoman and the regular one. I was asked this question while I was shopping in a Asian supermarket in Brussels.It is said that it is used as a dipping sauce for sashimi.Thanks. Sweet soy sauce has some additional ingredients like mirin and dashi that round out the flavor and make it milder. Regular soy sauce is just soy sauce. For cooking, regular soy sauce is fine since you're adding other things anyway, but for use as a dipping sauce the special ones can be interesting. I don't use most of those myself though since I tend to prefer my own 'mixes' so to speak. Fascinating! Thanks for sharing this with us. Wow, I did not know this much about soy sauce until I saw this post! Thank you for sharing such useful information. I always like having my ramen season with shoyu. :) Soy sauce gives that right salty taste that is not overpowering. Now, it is time to look for other soy sauce brands. Maybe a trip to Japan would mean also bringing home a bottle of soy sauce made in the classic/traditional way! That would definitely be a precious addition to anyone's cupboard. It is funny that you prefer yamasa over kikkoman. It made me feel strange and proved how tastes may vary. I always liked kikkoman and once after a longer break in having sushi I went to get myself some and it tasted just wrong, I couldn't understand why, unless I noticed that the dipping soy sauce we were served was yamasa and not kikkoman brand. It is not that it was a little bit different, it was just off. I've been using a brand of soy-sauce called "Lifesource". It's tamari soy sauce touted as GF/wheat-free, fat free, with no preservatives added. I'm very intolerant to glutens, can't take much sodium, no tolerance to MSG either, so this stuff is a very special and rare treat. Though I use tiny/diluted amounts, I find I don't have much issue with it as I did with other commercial soy sauce. I will check into genen and teien for the reduced sodium, hopefully there will be a brand out there which makes a GF/wheat-free, no MSG version. Thank you. what a wonderful and insightful article. Personally, I use the darker and stronger flavored soy (usually Kikkomen) for pickling as it seems to have a strong salt content, and for dressing foods at the table I use a lighter, milder type...can't remember the name but it's a Korean brand. This is awesome... love breakdowns of basic ingredients like this. Very interesting! I was wondering if Japan is growing genetically modified soybeans? If not, are the soybeans used for soy sauce always grown there in Japan? Does Kikkoman soy sauce have any GMO's? Thank you! Thanks for the wonderful article. Can you provide details on Kagoshima soy sauce which is sweeter? I think it's called amakuchi. Thick and Thick hot soy sauce like kimlan ? Very tasty , Any info on those? Just a note to say that in the Uk at least, Kikkoman's gluten free soy sauce is, essentially, tamari. That's what it says on the label. I am currently using it because I bought a bottle when our friends with a young, coeliac daughter visited and I didn't want to take any chances in my cooking. I'll be switching back to a less powerful sauce once this bottle is done though, it's a little too strongly flavoured for my palate. Yamasa makes two no-additive soy sauces, Marudaizu and Yuuki. Both are also supposed to use soy beans that are GMO-free etc. I'm in a similar boat as the previous commenter - in Japan but looking for some gluten-free soya sauce. You mentioned in your article "Some types of soy sauce also include fermented rice (kome koji) or amazake to give sweetness to the flavor." I would imagine these types would be gluten-free. Can you recommend any brands of gluten-free soya sauces? Help with the Japanese name would also be appreciated. Thank you for the excellent article - I had no idea there was so much to know about soy sauce! I will be living in Japan soon for a while and I would like to know, are there any 100% Tamari varieties available in Japanese markets? Also can I order wheat free tamari online while I am out there? I plan to carry a small bottle of it with me when I go out for sashimi, plain yakiniku or tamago kake don and such. Im hoping my strategy works for eating out because I really want to enjoy my time there, in spite of this pesky intolerance. You can buy 100% wheat free soy sauce (not just tamari) in Japan fairly easily, although you may need to look online or at health food stores or in the health-food section of department stores or supermarkets. Keep in mind though that soy sauce has almost no wheat gluten left in it - so unless you know you are ultra-sensitive to wheat, even regular soy sauce should not be a big problem. But again, if you are sensitive, you can get wheat-free soy sauce. Should nama-shoyu smell vinegary and sharp? Hello, first time commenter here. Thank you for your wonderful websites, I really enjoy your informational posts and recipes! I'm really hoping you can answer a question of mine. I bought a bottle of nama-shoyu from a seller on Amazon.com and when the bottle arrived, it was leaking and the cap was not tightly screwed onto the bottle. When I opened it and smelled it, it had a very sharp, vinegary odor like wine that has been opened and left to sit out. This smell is unlike that of any soy sauce I've had. Should nama-shoyu smell this way?